The Greatest Living Jazz Guitarist? Jim Hall receives a major award. On Wednesday, November 19th the National Endowment for the Arts (NEA) named Jim Hall, whom some call the greatest living jazz guitarist, an NEA Jazz Master. The Baltimore Symphony will premiere his latest composition, an as-yet-untitled piece for jazz guitar and orchestra, in June. And the long-unavailable "Jim Hall Live," one of his most important albums, was finally reissued on CD earlier this year by Verve. I learned this from an article in the Wall Street Journal by Terry Teachout : Jazz Master in a Low Key (The Wall Street Journal, Wednesday, November 19, 2003). I have more than a few Jim Hall albums, from years ago. I haven't listened to them in ages. I find Hall pleasant, and tasteful, but really not very interesting. I prefer Joe Pass - but he's dead. Hall is seventy-three. He's not. He's worked with everybody from Sonny Rollins to Pat Metheny and played everywhere from the Village Vanguard to the White House. His colleagues view him with something approaching outright awe. But Mr. Hall, like most jazz musicians, is unknown to the public at large - a fact that doesn't seem to bother him in the least. "It's a privilege to be able to make a living playing jazz," he says firmly. "Not too many people listen to me, but maybe I'd be nervous if I were a million-seller. I'd say, uh-oh, I did something wrong." I have not looked up Hall's book Exploring Jazz Guitar where Hall suggests that jazz musicians could learn from looking at the seascapes of J.M.W. Turner. I never liked Turner much either. Teachout admires Hall's "floating, fine-grained tone" which he describes as "smooth and edgeless, his wide-spaced harmonies subtly oblique." Yep, like Turner's blurry sunsets over the Parliament buildings on the Thames. Well, to each his own. ... the Jazz Masters awards, established in 1982, are little known save among musicians, and have heretofore been given out on what appeared to be a near-arbitrary basis. Now, however, the NEA is making a major push to heighten the profile of the program, increasing both the size of the cash prize and the number of recipients. Mr. Hall's fellow laureates for 2004 include Chico Hamilton, Herbie Hancock, Nancy Wilson, arranger-composer Luther Henderson and Nat Hentoff, the first jazz critic to be named a Jazz Master. ... In addition, the awards ceremony and concert, set for Jan. 23, will be telecast, and Verve plans to release a two-CD set of recorded performances by some of the 73 recipients. All this is heartening news for the practitioners of what NEA Chairman Dana Gioia calls "one of America's greatest contributions to world culture," especially since jazz has been largely squeezed out of the mass media in recent years. I'm glad Hall got this honor, but he's not to my taste. He was once. And I think he was better back in the seventies and eighties. I guess now the bop phrasing I liked is gone. And the recent stuff is a bit short on just plain melody. Hall got all experimental. I guess he's moving away from Turner toward Kandinsky or something. I rather he stopped thinking of his music in terms of late nineteenth and early twentieth century art. When he recorded albums with Paul Desmond they would just do a tasty slow cook on something like "All the Things You Are" and that was wonderful. Wait! Now we've move from art to cooking to explain music. Analogies. Dangerous things. Time to put on a Joe Pass album in the background. 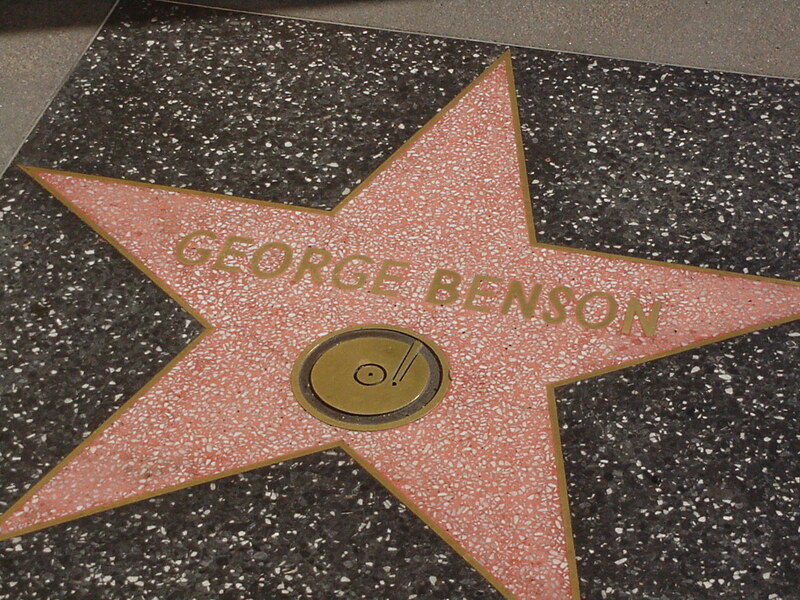 Out here on the Hollywood Walk of Fame George gets a star.